Dynamics / Distorters -- TanH Dist. TanH function for soft clipping. 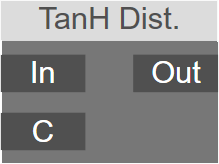 Applies a soft clipping (tanH) function to the signal. It prevents the output of the node to go above the 'C' linear level, and smooths the corner of the function.